Have you ever stood in front of the dairy case at the grocery store wondering about those “other” butters – the ones in the gold wrappers, the ones that come in a package half the size but double the price of the butter you’re used to? I know I have! I’ve long wondered what it’s like in there, what $10/pound butter tastes like, and if the butter churned from the milk of these idealized cows grazing on only the finest and greenest grasses of Ireland was really any better than the run-of-the-mill store brand butter I’ve always bought. So one day when I found myself feeling that old curiosity standing in front of the butters at our local Whole Foods, I took the plunge and bought 4 different butters (3 of them in those fancy gold packages!). In the past I’ve been held back by my relative foodie-solititude – but among the many perks of writing for a food blog is having a community of people who say YES! when you ask if they’d like to come over and try some butter. 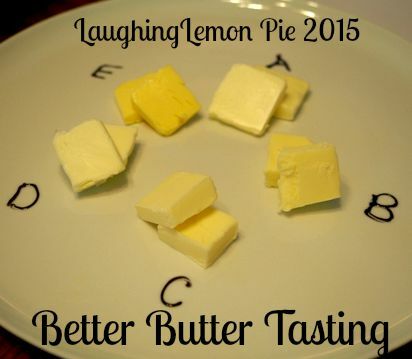 It might have helped that I mentioned the words “scones,” “mimosas,” and “shortbread” as well – the overall effect was rather undeniable and hence the 2015 Laughing Lemon Pie Better Butter Tasting was born. 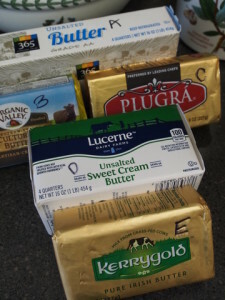 With the 4 butters I bo ught at Whole Foods plus my usual Safeway store brand on hand, we tested 5 kinds of butters ranging from $2.50 per pound to $10 per pound. I couldn’t bring myself to buy the most expensive butter on offer – it was $8 for 8oz. That’s $16/lb butter! Wow. But even when I’m trying to be extravagant I’m a cheap-o, and I just couldn’t do it. We figured it was either infused with gold, or perhaps made from the cream of unicorns hand milked by virgins. Some things are better left to the imagination, and $16/lb butter might fall into that category. 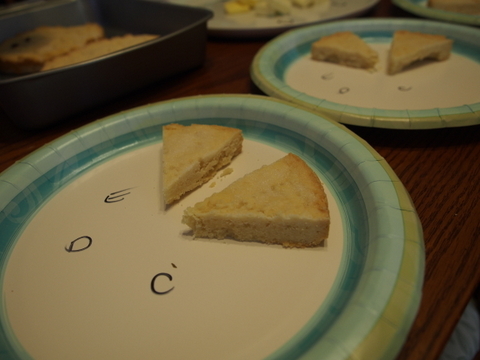 For baking I thought that shortbread and scones would be best for testing the butters’ taste. I chose the Scotch Shortbread recipe out of that good old standby, The Joy of Cooking (1997) (or the JOC as I call it). It’s a very simple recipe of working 1 cup creamed butter into 2 cups flour, 1/2 cup powdered sugar, and 1/4 tsp salt. Pressed into a pan, it gets baked at 325° for 35 minute s (more or less). 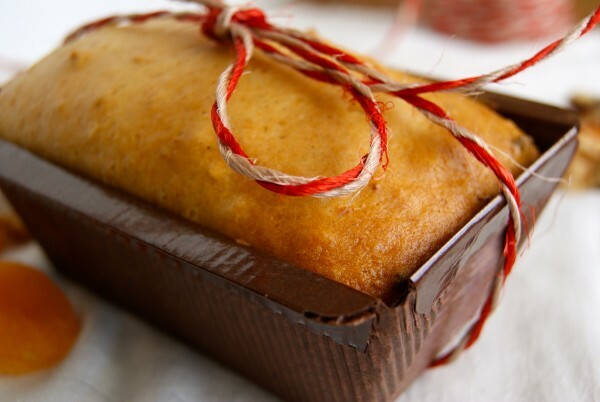 I topped it with a nice layer of white sugar – cuz what goes better with butter, really? The simplicity and near-lack of any other ingredients in this recipe let the butter shine, as it were. For Scones…that was a tough decision involving me thumbing through my vast collection of scone recipes, seeking a butter-based and simple one. Since I’ve moved onto cream scones, I haven’t been in the butter scone biz for a while and don’t have a particular go-to in that category. 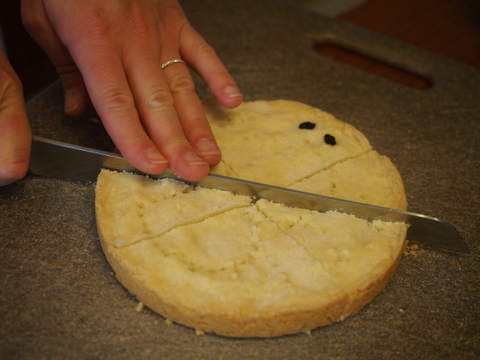 However, I found a 2013 recipe I’d clipped out of Bon Appetit for Adare Manor Scones – I had written “fave” in the margins, the ingredients were simple, and the directions uncomplicated so it won out. 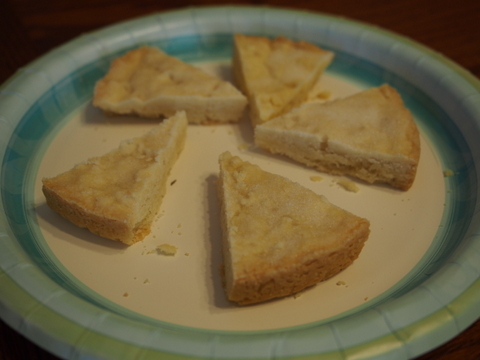 It’s a milk and butter scone – no eggs, no cream, no buttermilk or half & half. Just flour, sug ar, salt, baking powder, butter and milk. I used the Cooks Illustrated method of cutting the chilled butter into the flour using the food processor. 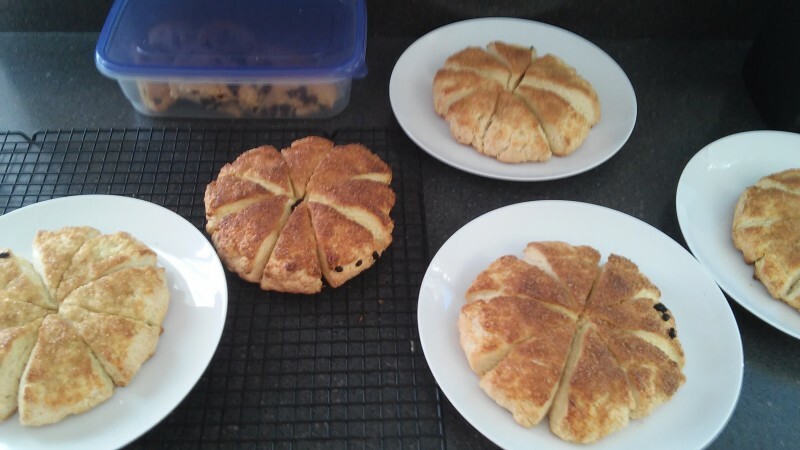 These were supposed to be cut out scones, but with the volume (40 scones) and the time crunch (wanting them to be freshly baked, but not wanting to wake up earlier than 6am) I just formed them into scored rounds topped with eggwash and turbinado sugar. So that was the process, what were the results already? There was a tie for first place and…they were both store-brand! Our A & D, Whole Foods 356 ($4/lb) and Lucerne/Safeway ($2.50/lb), were the most universally liked butters. B & C, Organic Valley ($8/lb) and PLUGRA ($7.58-$10/lb), fell in the middle of the pack – not un-liked, but not standing out as special. And poor E, Kerrygold ($8/lb), was universally dis-liked. I have to take some of the blame for Kerrygold’s failure – it is a salted butter. It doesn’t say so on the front of the package, but I know I read that on the ingredient list but then somehow didn’t factor it into my baking. I should have reduced or eliminated the salt in both recipes when baking with it. Tasters thought it came off salty, and that was my fault. It did however have several other characteristics that were hard to get over – it was very yellow and had a chemically taste. 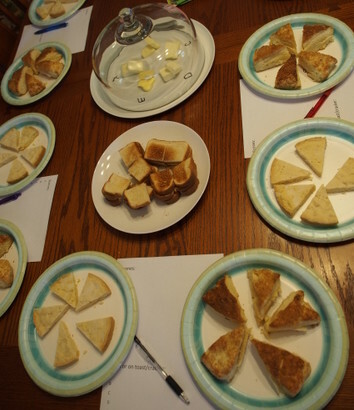 Tasters were openly debating whether or not I might be trying to trick them by putting a margarine into the test, that’s how much and how oddly Kerrygold stood out! And that is the butter I most wanted to like – I’ve always coveted it in the store and imagined it to be the epitome of butters! Ha! It just goes to show you the power of good packaging. That cow and the idea of the green Irish meadow grasses have tugged at me for so long, but no longer! One very deep thought came up as we tasted, and may further reflect on our reaction to Kerrygold – we wondered if we had a European on the tasting panel what their opinion would be. In other words – did we North Americans like the American store-brand butters best because that is what we’re all used to? What we’re conditioned to like? What we recognize as tasting “good?” There really wasn’t an answer to that, but it was interesting to consider our cultural biases and experience and how those impact our palates. Overall it was amazing to me how little relative difference there was between the butters. Many stood out “in no way whatsoever” as one taster said. 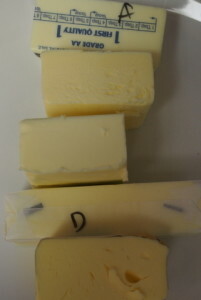 For the most part the butters were quite mild, tasters often reacted to differences in their saltiness but not many comments on how buttery any of the butters tasted. Whole Foods 365 and Lucerne performed well in baked goods, but as for plain butter as a spread or condiment tasters agreed that A and B were tops – Whole Foods 365 and Organic Valley European Style Cultured. 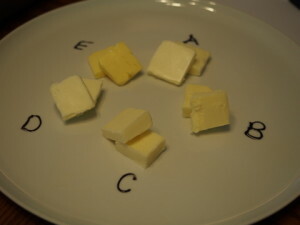 The venerated baker/scientists at Cooks Illustrated did a butter tasting in 2011 and found similar results. 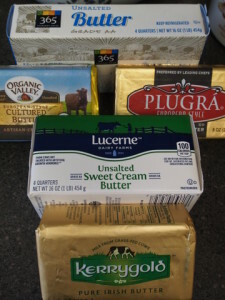 Their tasters like PLUGRA best (as did one of ours), but regular butter (they used Land O’Lakes) was recommended overall due to the small difference in taste vs the big difference in price. Now, some of you are wondering what exactly is “better?” Better is kind of a judge-y word, implying some kind of superiority. Obviously I chose it because “better” next to “butter” is kind of a headline no-brainer, and it gets the basic point across. “Better” here was meant to signify butters other than the generic grocery store brand – those pricier ones that we often pass by. One could assume based on their price that those butters are superior in some way. 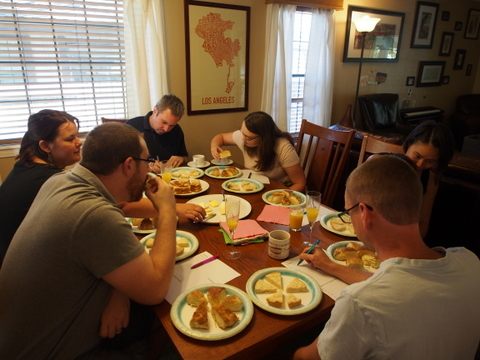 However, our small tasting group decided that grocery store brands were actually the better tasting butters. “Better” could signify a range of factors though, like environmental (grass-fed) and health (organic). Better butter could mean more expensive, but/and it could mean better for the environment and you – often and lately those two overlap. Unfortunately a lot of those factors are difficult for the consumer to determine in-store. That’s why it can be nice to shop at a place like Natural Grocers/Vitamin Cottage where they’ve fastidiously narrowed down the choices for you by only stocking pasture-raised dairy products. I didn’t particularly seek out grass-fed or organic butters for this testing. I’m not looking for the “best” butter for me and the environment because frankly I don’t think that exists. Personally, I’m trying to cut dairy/beef products out of my diet altogether – organic, grass-fed, conventional, CAFO or otherwise – mostly for environmental reasons (water usage and carbon/methane emissions). There are some shocking numbers associated with gallons of water needed to make butter – it’s hard to pin down, but estimates range from 665 gallons of water per pound, to 2,044 gallons of water per pound, and up to 2,586 by my own math if you multiply the 122 gallons of water to make a pound of milk by the 21.2 pounds of milk required to make a pound of butter. *See Comments* Basically, if you weren’t already using butter judiciously for health and weight reasons, the environmental impact of the stuff should encourage a very limited use of this product. So, overall no big butter switch over here as a result of this weekend’s tasting. It’s nice to know that the plain old wax paper wrapped store-brand butter I’ve always used pleases most palates. Lacy’s go-to butter is Costco’s organic butter, I wish I’d added that to the panel. Do YOU have a favorite butter? Tell us all about it in the comments section below! OK, one gallon = 4 quarts. So 1lb of butter = the cream of 2.75 gallons of milk. If milk is 122 gallons of water per gallon that would be *just* 335.5. So I’m still confused about how much water, cuz that math doesn’t seem near any of the other sources I found either. Harumph. I have been awaiting the results of your butter test since you announced it the other day. Thanks for putting so much time and effort to answering a question that I have been thinking about myself. Ever since a trip to Ireland and most recently to France, I have wondered why we do not have good, creamy, delicious butter in the US. For many years, I have been used whipped butter (usually Land O’Lakes brand) for table butter in our house. It is ok, but does pale in comparison to the incredible butter tasted in Europe. Plus, I have read but have not been able to confirm that Land O’Lakes is GMO friendly…trying to steer clear of companies who are continuing to promote GMO. Here in the US, I have found Plugra seems to be the closest to a European butter. Hard to justify the cost though. Thank you for introducing me to the concept of environmental impact and the making of butter. I had no idea. Loved this post! Thank you for sharing your findings. You’re welcome, and thank YOU for such great feedback. The Kerrygold brand is the only butter of the group that comes from truly healthy cows that are allowed to roam free and eat grass (not mildly corn and soy like the other butters you tried most likely are). Therefore, the nutritional content is much better in that butter (heart-healthy CLA, vitamin K, etc). The deeper the color, typically the better the quality of butter and health of cow. The stronger/richer "buttery" flavor is what you get with high quality butter! I highly recommend looking into the benefits of grass fed butter, you'll never regret it and never go back! Do you have a grass fed butter you’d recommend? (other than Kerrygold?) I agree with that so much in theory – I was really thrown off and disappointed to not enjoy Kerrygold more, it seems like it should be superior in taste. Interesting. I really like the overpriced Euro-butters better for eating, but for cooking/baking, I use anything that is unsalted. I find that when I return from certain European countries where good butter is prized, I am more attuned to the European style here. It quickly wears out, however.